– Clearfield has won 48 of its past 53 games overall and is 7-3 in the postseason since the 2010 season. The Bison are seeking their fourth consecutive District 9 championship and their 7th in the past 10 years. – This is the 18th District 9 championship game in Bison history. Clearfield is 10-7 in D9 title games since the PIAA playoffs began in 1988. Shown below are the results of the 17 previous title games Clearfield has appeared in with links to the d9sports.com recap of each game since 2000. – Clearfield and Bradford met annually from 1984 to 2006 and met another 5 times in the district championship game. Last year was the first time the two teams had played since 2006, but Clearfield’s 49-0 win was uncharacteristic in a series that typically featured close games and strong performances from each side. In fact, two of the five highest rushing outputs by a Bison opponent were recorded by the Owls. The most rush yards given up by Clearfield are shown below. – This season, Bradford has struggled to a 2-7 record. Their 2013 schedule is shown below, courtesy of maxpreps.com. – Clearfield’s win completed the school’s 8th undefeated regular season since 1939. Half of those undefeated seasons have come since 2004, including three in the past four years. The Bison have now won 22 consecutive regular-season games and 48 of their past 53 games overall. In the regular season, Clearfield has gone 37-1 over the past four years and 52-6 since the start of the 2008 season. The 2013 team ranks 4th in total margin of victory, beating its opponents by 250 points over the course of the year. The 1955 team ranks first with a 273-point margin of victory. All 8 undefeated teams have a total margin of victory of at least 208 points. – Christian Lezzer’s career-high 251 yards rushing ranks 12th in school history and is his third appearance on the 200+ yard rushing list. Lezzer now has 3,665 career rushing yards, placing him just 14 yards behind Josh Harbold (2002-2004) and his 3,679 career yards. For his career, Lezzer has an even 500 carries and 57 rushing touchdowns. – As a team, Clearfield surpassed the 3,000 yard rushing mark on the season, becoming the 5th Bison team to do so. Clearfield currently has 3,141 rushing yards and 47 rushing touchdowns this season; the school records are 3,655 rushing yards (2011) and 50 rushing touchdowns (2002 & 2011). – Clearfield has won 47 of its past 52 games overall and 40 of its past 41 regular-season games. The Bison are on a 21-game regular-season winning streak. Philipsburg-Osceola was the last team to beat Clearfield in the regular season, doing so in Week 6 of the 2011 season by a score of 40-33. – With a win against the Mounties, Clearfield would wrap up its 8th undefeated season and it’s third in the past four years. Clearfield has gone undefeated in 1939, 1955, 1994, 1998, 2004, 2010, and 2012. – A win Friday would also secure the Bison’s 6th MAC championship; Clearfield joined the league in 2004. Since joining the MAC’s Allegheny Division in 2010, the Bison have won the conference each season. They also shared the league title as a member of the Nittany Division in 2008 and won the league outright as a member of the Seven Mountains Division in 2004. – While Clearfield and P-O have played each other 53 times since 1956, the Bison also faced Philipsburg High School and Osceola Mills High School before those two schools merged in 1956. Clearfield was 9-10 versus Philipsburg from 1937-1955. 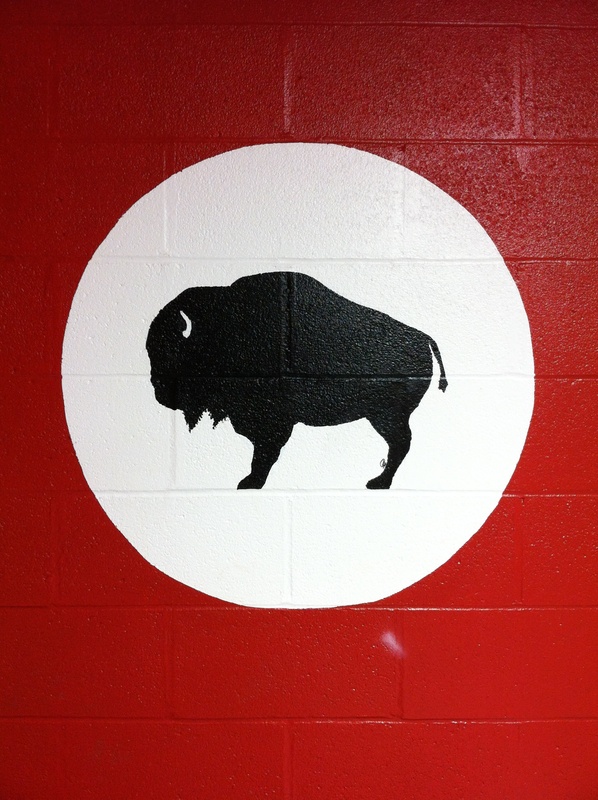 The Bison went 9-2-2 against Osceola from 1940-1955. Overall, Clearfield is 48-35-2 since 1937 against the schools that now comprise Philipsburg-Osceola. – Chad Kroell’s 7 touchdown passes against P-O in 1994 is tied for the school record for touchdown passes in a game. Kroell also threw for 7 touchdowns against St. Marys that same year. – Dave Richards ran for 542 total yards against the Mounties in 2001 and 2002, becoming the only player in Clearfield history to rush for over 200 yards against the same school twice. Richards also accomplished this feat during the 2002 season against Punxsutawney, rushing for 228 yards against the Chucks in the regular season and 314 in the District 9 championship game. – Tyler Stratton’s 203-yard game is the 36th time in Clearfield history in which a Bison rushed for 200 or more yards. Christian Lezzer rushed for 202 yards earlier this season against Huntingdon. Sixteen different Clearfield players have now broken the 200-yard mark since 1937. – Stratton also became the 12th Bison to surpass 2,000 career rushing yards. He now has 2,112 career yards and is 131 yards behind Pat Davis for 11th place on the all-time list. Stratton and Lezzer have combined for 5,526 career rushing yards, more than any other pair of classmates in school history. Isiah Morgan and Jarrin Campman (2008) are second with 5,099 career yards. In third place are Ken Wisor and Jim Lewis with 4,604 (1998). – For the season, the Bison have rushed 425 times for 2,762 yards (an average of 6.5 yards per carry) and 40 touchdowns. Through eight games, they rank 13th in total rushing attempts, 8th in total rushing yards, and tied for 6th in rushing touchdowns among all teams in school history. – With one week to go in the 2013 regular season, the unofficial District 5/6/8/9 subregional points rankings are shown below. Full standings can be seen at the Pennsylvania Football News website by clicking here. – Clearfield has won 46 of its past 51 games overall and 39 of its past 40 regular-season games and is on a 20-game regular-season winning streak. Bald Eagle Area is one of just four teams that have beaten Clearfield in the regular season since the start of the 2009 campaign. The Bison fell to DuBois (35-21), Tyrone (23-14), and BEA (34-21) in 2009 and Philipsburg-Osceola (40-33) in 2011. – In 2002, Dave Richards set the Clearfield single-game record for rushing yards with 16 carries for 363 yards against the Eagles. He also set the District 9 record for rushing touchdowns in a game. The d9sports.com recap of the game can be found here. – Terry Briskar also had an impressive rushing performance against BEA in 1968, racking up 264 yards on 46 carries. Briskar’s number of carries stands as the school’s single-game record. The following week, Briskar carried the ball 41 times for 235 yards in a win over Curwensville. In total, Briskar ran for 499 yards on 87 carries during the final two games of the 1968 season, giving him 1,151 yards for the year. He was Clearfield’s first 1,000-yard rusher since Vic Jones in 1955. – Spencer Herrington became the leader in career field goals made from 1993 to the present (all data is complete dating back to 1993). With his two made field goals Friday night, Herrington passed Kyle Kline’s record of 5 made field goals. Kline went 5-for-6 on field goals in 2006, his only year as a Bison. Herrington is now a perfect 6-for-6 in his career. – After catching four passes for 75 yards, Christian Lezzer became the first Bison to earn a spot on the career yardage lists for rushing, passing, and receiving. He ranks 3rd in career rushing yards (3,336), 14th in career passing yards (1,885), and 31st in career receiving yards (529). He is also the first Clearfield player to lead the team in each of those categories for a season. Lezzer led Clearfield in passing in 2012, rushing in 2012, and receiving in 2011. Tyler Stratton could join this list this year, as well. He rushed for 1,151 yards in 2012 and currently has 710 yards this season. – Friday night’s win was the 20th consecutive regular-season victory for Clearfield, breaking the school record of 19. The entire streak is shown below. – Clearfield has won 45 of its past 50 games overall and 38 of its past 39 regular-season games. The Bison are on a 19-game regular-season winning streak. 19 – 2011 to present. Began in Week 7 of 2011 season by beating Hamburg, 34-28. 19 – 2009 to 2011. Began in Week 7 of 2009 season by beating Penns Valley, 42-6. Broken by Philipsburg-Osceola in Week 6 of the 2011 season, 40-33. 19 – 2003 to 2005. Began in Week 3 of 2003 season by beating Indian Valley, 37-22. Broken by Bellefonte in Week 4 of the 2005 season, 40-34 in double overtime. 14 – 1993 to 1995. Began in Week 8 of 1993 season by beating St. Marys, 12-0. Broken by Brookville in Week 2 of the 1995 season, 20-0. 12 – 1997 to 1999. Began in Week 10 of 1997 season by beating Curwensville, 35-20. Broken by Brookville in Week 2 of the 1999 season, 26-7. 12 – 1955 to 1956. Began in Week 1 of 1955 season by beating Osceola Mills, 46-0. Broken by DuBois in Week 3 of the 1956 season, 33-19. 12 – 1939 to 1940 (unbeaten streak; includes one tie). Began in Week 1 of 1939 season by tying St. Marys, 12-12. Broken by Punxsutawney in Week 2 of the 1940 season, 7-6. – Tyrone came to Clearfield in 2008 riding a 35-game regular-season winning streak of its own, but the Bison upset the Eagles 35-34. The game story from The Progress can be viewed here. – While this site focuses on Clearfield football from 1937 to the present, research done by Kris Albright has found scores for the program dating back to 1904. The stats shown on this site only reflect the post-1937 era, but Clearfield played football for nearly 35 years before this time. When these years are taken into account, Tyrone is Clearfield’s fifth-oldest opponent that it still plays in terms of year of the first matchup between the teams.